It was announced this week that CNN’s head clown, Jim Acosta, found the time between diary entries on Twitter to write a book about his “frightening” experiences covering the Trump White House. Calling it “The Enemy of the People: A Dangerous Time to Tell the Truth in America,” Acosta signals that he believes there is still money to be made playing the martyr to Trump’s oppressor. We’ll see if that’s true, or if, as we believe, the American people – even on the left – are fed up with this idiot’s grandstanding antics. “Simply put, I am writing this book to share what I’ve experienced covering President Trump during his first two years in office,” Acosta said in an interview with CNN. “This sobering, bewildering, and sometimes frightening experience has made it absolutely clear that this is a dangerous time to tell the truth in America. Acosta’s most recent embarrassment was a trip to the border wall in San Diego, where he marveled to viewers how calm and peaceful it was. This earned him an unending stream of mockery – including from President Trump himself – as Twitter users pointed out that he had just made a perfect case for building a wall across the entire border. 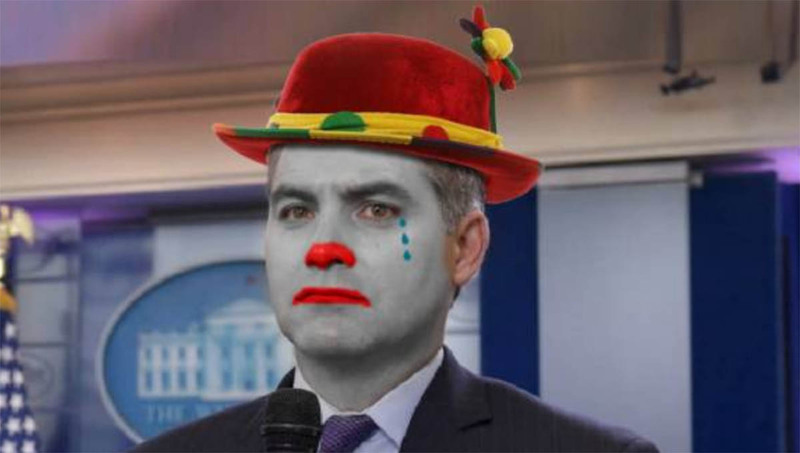 Acosta’s book will be out this summer, by which time we’re sure this clown will have embarrassed himself many more times for the gratification of CNN’s dwindling audience.